Four tray food dehydrator for fruits, vegetables, meats, and herbs. Expandable to eight trays. 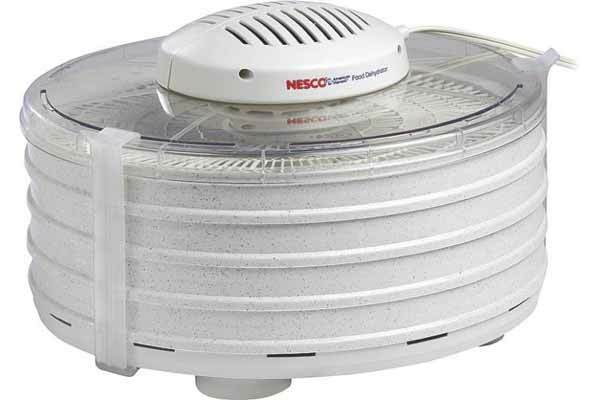 Bottom-mounted fan provides consistent air flow for quality results. See through top tray for easy inspection. Fully immersible in water and dishwasher safe for easy cleaning. Make homemade jerky and apple chips, saving you money while enjoying healthy snacks! Ideal for making jerky from meat, poultry, or seafood. Top mounted fan and heater keeps dripping out. Food easily releases from trays. 13 1/2 inch diameter trays. I love making jerky with this dryer. It makes a solid amount and is easy to clean!